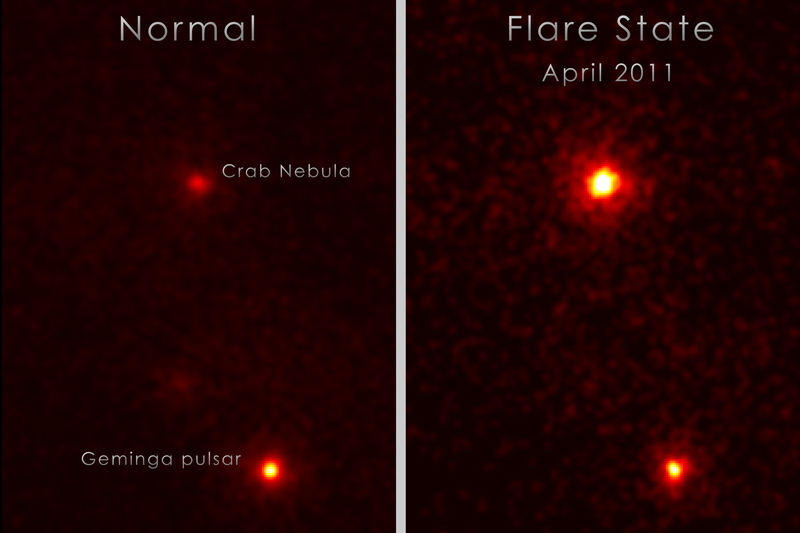 Update to our previous posting about gamma ray flares being observed from the Crab Nebula, ongoing evidence that the nebula is being impacted by superwave cosmic ray electrons. On April 12th, 2011, the Crab Nebula emitted a gamma ray flare lasting six days that was five times more intense than any of the others that were previously observed and 30 times brighter than the nebula’s normal gamma ray intensity. On April 16th an even brighter flare occurred but faded out over a period of two days. As stated in the previous post, I had predicted this high energy variability of the Crab Nebula almost 30 years ago in my Ph.d dissertation and in a subsequent 1987 journal publication. It is only recently with the launching of the Swift gamma ray telescope that regular measurements of the Crab Nebula at gamma ray frequencies have been made possible. As I proposed then, the Crab Nebula’s unusually strong luminosity does not originate from its associated neutron star but from a volley of galactic cosmic rays that are striking it face on. Since this volley can change its intensity quite rapidly, so too the intensity of the Crab Nebula’s emission will change in step. This would be most noticeable at gamma ray frequencies since the very high energy cosmic rays producing the gamma synchrotron radiation lose their energy quite rapidly, hence intensity changes become more noticeable than at, for example, optical frequencies where the lower energy cosmic rays have lifetimes of many years and hence smooth out any flare activity. Astronomers are currently at a loss to explain what they are seeing simply because they are ignorant of the superwave theory. Do your part and inform them. As indicated in your earlier post, if the superwave relativistic cosmic rays enter the nebula diffusely over a wide area, how is it then we see short-term flaring activity in the nebula? Would not the wide area impacted by the high intensity superwavefront average out over the entire nebula, thereby producing a more steady gamma ray emission? Afterall, the nebula is certainly not flat, but spherical in geometry. Correct? Very good question. I will answer this in a posting due to the long length of the explanation. From Astronomy Picture of the Day on May 23rd. Compares normal state to flared state.